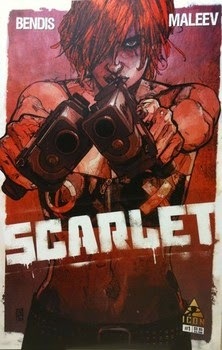 My recent foray into Bendis' works has led me to Scarlet, a story about a young woman whose life takes a turn for the rebellious when her boyfriend is murdered by corrupt police officials. It combines the corrupt vice cop tales with more a more anti-police brutality and anarchist bent that should be unsurprising considering current circumstances. When Scarlet's boyfriend is killed by a police officer who is promoted following the shooting, Scarlet goes for revenge, killing officers and inciting what seems like revolution and borders on riots. The story is filled with action, snappy dialogue, and a character whose blunt enough to give the story a no-messing-around feel. Scarlet herself is an interesting character. She's able to persuade the people around her and seems to be beholden to a values system that has integrity, though that's obviously debatable. But, Scarlet isn't exactly well-developed. Bendis shows Scarlet as a fairly normal young adult and, following the event and a stint in the hospital, then as a person driven to extremes, but the route from A to B isn't always clear or convincing. Yes, she's sad and disillusioned, but the journey to it wasn't enough for me. I expect that as the series evolves that Bendis will expand our look into Scarlet's mindset, but for me it wasn't really a wholly convincing jump. I was also left wondering how she is able to convince people to join her so easily. Her story isn't just journalistic-expose type stuff, but instead vigilantism in a modern, non-Gotham world. The plot is quick-paced, but also leaves something to be desired. Scarlet posts a video of herself explaining the corruption of the police and then killing an officer. She makes the FBI's Most Wanted List, and begins to rally the people of Portland. She even goes so far as to appear in person at a rally with a police presence. Under FBI direction, she isn't arrested, tailed, or shot. It just didn't seem feasible to me. I'll give that they don't want to incite a riot and don't shoot her, but the lack of action entirely seemed a bit off. Maybe I'm just too cynical. The art is fantastic. 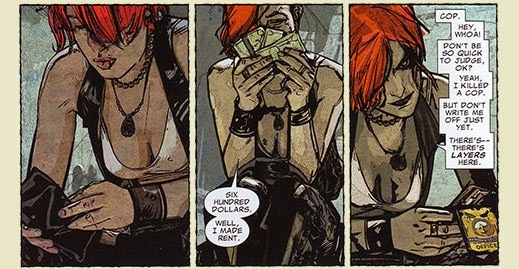 Alex Maleev uses a muted palate and really uses the panels well. His depiction of Scarlet was great. The artwork is done in a realistic style and is convincing. She's supposed to be pretty run-of-the-mill, and I believed it in the way he showed her. Maleev's sense of proportion and dimension are strong and he conveys them well on the page. On top of that, Scarlet and the other characters feature extremely nuanced facial expressions, conveying easily the range of emotions that they experience and that may, otherwise, not be apparent simply via dialogue. Unlike other earlier artists who worked with Bendis and Bendis himself, Maleev doesn't hit shadow hard. The color palate leaves the art a bit understated and not overwhelming. It's very eye-appealing. This wasn't my favorite of the list so far, but I'd be willing to see where it goes. I suspect it's just not established enough to answer a lot of my questions. Up next on my Bendis reading list: Goldfish.